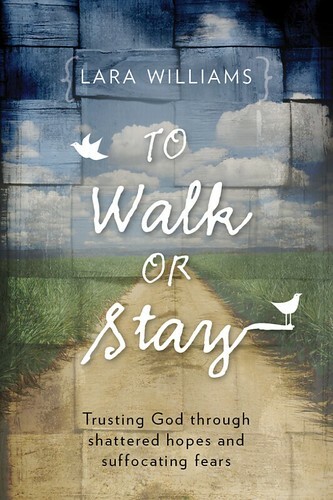 With his permission, blessing and bravery, my husband’s betrayal lays the backdrop for To Walk or Stay. But neither my husband nor his sin is the focus of this book. For all have sinned and fall short of God’s glory. He takes ownership for what he has done in our marriage to pull us apart. I take ownership for what I’ve done to pull us apart. And we both believe that God wants to use our unfolding story of redemption to encourage and empower others. This is an amazing book!…Letting go of our “rights,” disappointments, and expectations of others liberates us to forgiveness, restoration and trust. Her book will help transform your relationship with God which always leads to transformation with others. I’ve read lots of books on marriage but none of them have captured the beauty, lyrical quality, and biblical truth found here. Lara opens the shutters of her soul and lets us see the raw emotions and devastating hurt of betrayal fleshed out in gut level honesty. If you want a lasting love relationship that will go the distance, I highly recommend To Walk or Stay. This book is not data or theory. Lara writes out of the backyard of her own life and bares her soul. Chapter 4: Do you think I’m pretty?